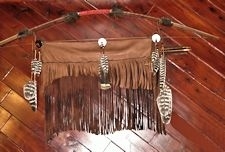 This authentic buckskin quiver has extra long fringes in your choice of leather colors (rust brown shown) and bead colors. Hand crafted in the USA. This quiver has three abalone conchos that are about 1 1/2" in diameter. It is also decorated with hard to get barred turkey and bronze turkey feathers held in place with glass crow trade beads. The quiver is also decorated with your choice of a 3" medicine wheel (shown), 3" dreamcatcher, 4" fur mandella, or a fringed medicine bag. This buckskin quiver comes with a matching beaded, leather and fur wrapped bow and two beaded arrows with real stone points. 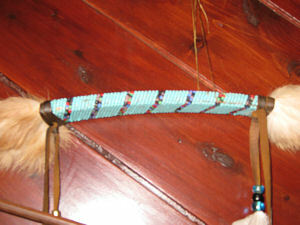 The quiver is tied onto the bow and the leather ties are decorated with beads and feathers. The bow has four bundles of fur and is wrapped in buckskin on either side of the beadwork. The beadwork shown is representative, no two beadwork patterns are exactly alike, but you can pick the predominat colors. The bow is for decorational use only and is about four feet long. The arrows are made just as they were over a hundred years ago. 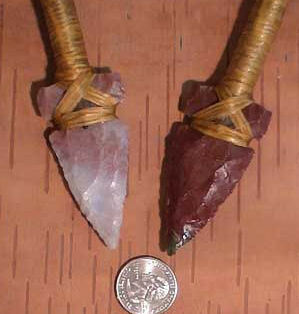 The feathers are hand fletched, and the feathers and arrowheads are tied in the old way with sinew. 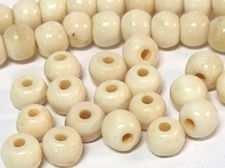 Use the drop down menus below to specify the accessories you want added, and your preferred leather and bead colors. 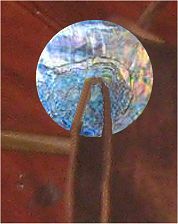 The bow and quiver pictured is representative. Because each one is hand made to your specifications, and no two hides are shaped exactly the same, each one will vary slightly. Because each one is made to your specifications when you order it, allow a few days for construction time. This product was added to our catalog on 11/06/2009.